Again this year, bills to have North Carolina ratify the ERA have been introduced in the NC General Assembly. The introduction was highlighted by a gathering of ERA supporters across the state at the Legislative Building. AAUW was represented by Co-President Cherrie Wheaton and Public Policy Co-Chairs Denny McGuire and Laura Garmendia. Representative Floyd McKissick, an ERA supporter who has introduced the ratification legislation in previous sessions, has a post on his Facebook page where he thanks three additional AAUW members for their work: Marena Groll, Roberta Madden, and Gailya Paliga. 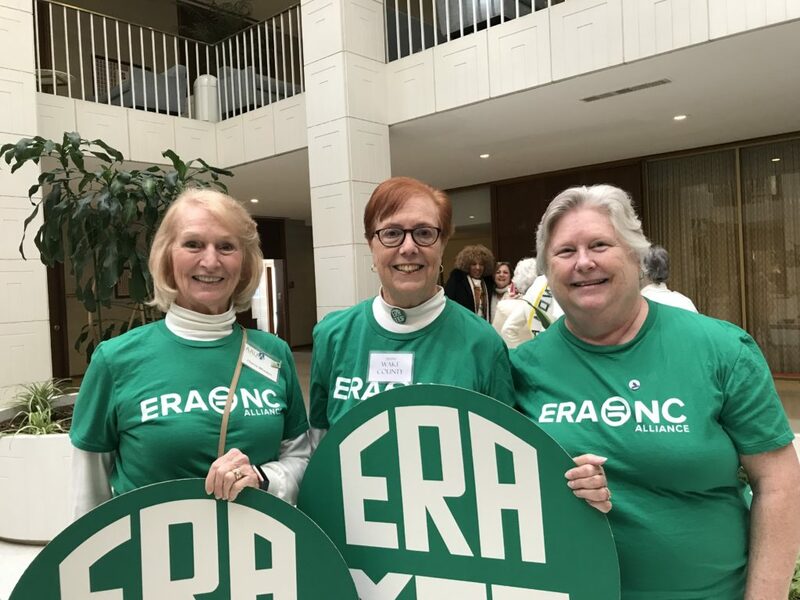 The ERA is a long-time AAUW (and AAUW NC) priority and we, too, thank those members for their work on this issue. members than in years past. the Rules Committee and there has been NO ATTENTION or ACTION on either bill in a month. the Judiciary committee, found favorable, and sent to the floor for a vote as soon as possible.